Trump Watch #16. Click for more. Yeah, you know those theories that Trump tweets when he’s bored or otherwise unoccupied in the White House? We decided to compare his daily tweet rate and the volume of official events on his public schedule. And the result was… nah. Can we explain Trump’s tweet habit by the amount of spare time he has? Nnnnope. Correlations are minimal between his tweet rate and both his schedule and golf habit. There is actually a small positive correlation between the number of events he has scheduled and the number of tweets he sends out. So, we can probably toss out the “Trump tweets because he’s bored” theory and look at his account as an unfiltered PR tool that he’s been relying on with increasing frequency as his presidency has gone on. So, thanks to the good folks at Factbase, we have a free downloadable database of the President’s public schedule. 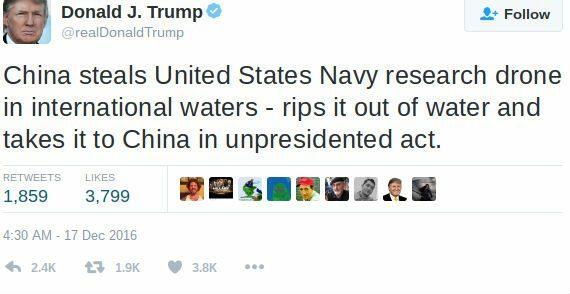 Cross-referencing this with our own Trump Watch archive, we can look at his unpresidented social media activity along side his Presidential activity. First, let’s compare his daily tweet frequency since he took office to his average number of public events (both are calculated as X/days of administration, for comparison purposes). Don’t see a whole lot of similarity there, do you? Neither do we, and neither does Math — the correlation between the two datasets shows a tiny positive relationship of just +0.31. How about the golf theory – that golfing and Twitter go hand in hand for the Big Donnie 45? Nothing to see there, either. Yeah, Trump plays golf a lot, but even that is a pretty low frequency compared to the amount of daily business the President conducts (or the number of tweets he sends out). The correlation between his golf schedule and his tweet frequency is a measly -0.10. So what gives? Well, looking at his tweet frequency, it’s basically just going up steadily over time. After bottoming out at 5.03 tweets/day just 3 months into his administration, on April 15th & 16th, 2017, Trump’s twitter rate has steadily climbed, to 8.13 tweets/day, on January 23rd & 24th, 2019. That’s correct: his high water mark is right now. Negative results can be really useful and are consistently undervalued by both the journalistic and academic communities. In this case, testing hypotheses that prove to not bear out helps improve our understanding of one of the 45th Presidents’ defining features as a politician: his social media activity. Sure, Barack Obama was the first President on Twitter (starting @BarackObama in March 2007, 9 months after Twitter’s founding); but he never used it as an explicit extension of the bully pulpit, fired members of his cabinet via Tweet, or engaged in direct diplomacy online and in public. President Trump’s use of his Twitter account is fundamentally new. The temptation is to either treat his Twitter activity as somewhat frivolous, a sideshow to the real policy agenda of this administration or to get sucked into hanging on his every character, typo, and implied threat. The former ignores the very real political effect of his single most successful political strategy (controlling the political narrative via Twitter) and the latter plays directly into that strategy. No Comments on "Trump’s tweet frequency is not dependent on his work schedule"